Biological Billboards. Human Directionals. Banner Shakers. Sign Twirlers. Whatever you call them, they’re eye-catching. 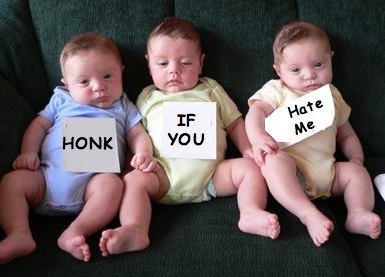 And they’re in Honk If You Hate Me. I first noticed these folks standing on street corners, swinging and flipping and dancing their signs for motorists’ attention, when I moved into my new home development seven years ago. I assumed that the local home developers were hiring kids from the high school to point the way to the real estate offices, and that the kids had decided to have a little fun with it. Donning headphones and dancing to a groove only they heard, they twirled and flipped their signs in a manner that, while it didn’t make me turn the way their signs pointed, thoroughly entertained me while I waited for the light to turn green. It seemed like a good weekend gig for teens needing spending money. Turns out I was wrong. 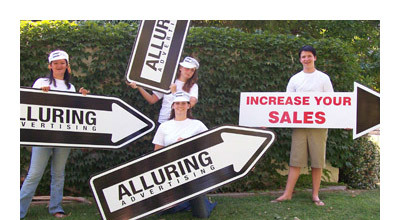 Sign twirling is no casual weekend gig, it’s actually a thriving industry in itself. Large companies have amassed staggering payrolls of people willing to do 5- to 8-hour shifts on street corners, up to 40 hours a week, as a regular job. These companies send their employees to spin camps, run by spin instructors, and train their recruits in the spinning techniques. Recruits get $.10 raises for every new spin they add to their repertoire, and they can spike their pay up a full buck by inventing new moves, which must be submitted to “trick review boards.” So it would seem that banner shaking isn’t the spontaneous joy-of-the-job kind of boogying I’d thought it was. Yet I couldn’t let go of the grassroots feel of sign twirling. That’s what eventually made its way into Honk If You Hate Me. When the former Burger King employee starts his own burger joint with nothing but an old card table, some paper plates, a single barbeque, and a few willing buddies, he needs a way to advertise. And he needs to do it on the cheap. Above all, he needs it to reflect his raw enthusiasm for his venture. So I put a sign in his hands, headphones on his ears, and a little hip-hop in his feet. When Mona stops at the street corner and grills him with questions, her questions mirror the ones I had as I watched those first sign twirlers in my neighborhood seven years ago. Hmm, I wonder . . . if big companies can sell million-dollar houses using sign twirlers, how many books do you think I could sell with my own set of human directionals? You’d pay attention to them, wouldn’t you? *”Honk If You…” is an occasional series about inspirations, backstories, and random stuff tucked into my teen novel Honk If You Hate Me.